I just love Bellas. They are so girly with images perfect for my daughter who thinks she is way older than she is. This card I made for SCS sketch challenge (sc174). 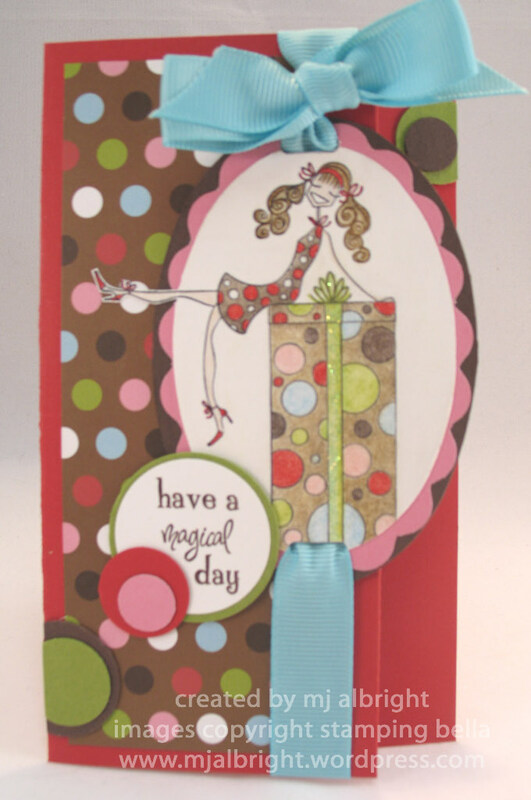 It’s a busy looking card, but I think the image, patterned paper, and layout all work well for the sketch challenge. STAMPS: Stamping Bella Presentabella and have a magical day sentiment. CARDSTOCK: SU! Real Red, Chocolate Chip, Whisper White, and Old Olive CS; American Crafts A la Mode Bon Bon PP. INKS: Stazon Jet Black; SU! Real Red and Chocolate Chip Stampin’ Write Markers. ACCESSORIES: Prisma Pencils; Eucalyptus Stickles; American Crafts Solid Lt Blue 5/8″ Grosgrain Ribbon; Horizontal Slot Punch; Coluzzle Cutting System; 3/16″ Corner Rounder Punch; 1/2″, 3/4″, 1″, 1-1/4″, and 1-3/8″ Circle Punches. Such a beautiful card! Love how well everything ties together and how you’ve repeated the polka dots here and there. Very pretty!!! This looks very pretty ! I like the layered punched circles; really ties everything together 🙂 What a fun card!